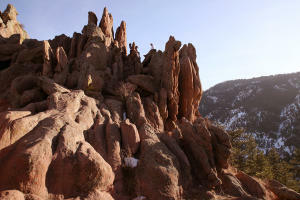 What&apos;s the best way to feel like a local and really experience the true Boulder? Discover its neighborhoods. Boulder’s neighborhoods each offer a different flavor, from pizza and rock n’ roll on University Hill to cutting-edge cuisine and burgeoning breweries in East Boulder. Tip: You’ll notice that all the business listings across this website can be sorted by these same neighborhoods. Just select the “Location” drop-down to filter by a neighborhood of your choice. 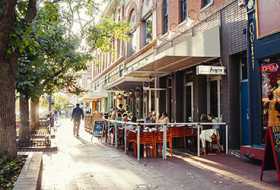 Downtown is the always-lively heart and soul of Boulder, which centers around historic Pearl Street. This brick-paved pedestrian walkway is lined with independently owned shops, acclaimed restaurants and distinctive Victorian-era architecture. The shopping and dining continue on Pearl East and Pearl West, plus a few blocks to the north and south of Pearl. 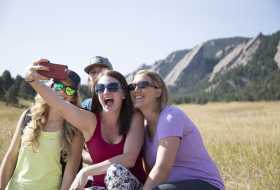 It’s where visitors come to stroll, tech startups come to work, farmers come to sell their bounty at the Boulder Farmers Market and Boulder locals gather for great events and entertainment. University Hill — more commonly referred to as simply “The Hill” — is just up a (you guessed it) hill from downtown. As the neighborhood across the street from CU’s campus, it is a hub of social activity for students and those who come to enjoy great food, drinks and live music. 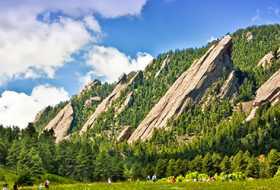 The Chautauqua district is located at the base of Boulder&apos;s Flatirons and is one of the most scenic and popular destinations in town. 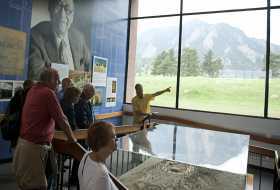 This historic area of Boulder centers around the Colorado Chautauqua, founded in 1898 as part of national series of cultural and educational summer retreats to which orators, performers and educators traveled, bringing lectures, performances, concerts, classes and exhibitions to the public. Today, people visit for the natural lands, a sprawling park, rental cottages, performance venues and an esteemed restaurant. Come for an evening at the Chautauqua Auditorium, built in 1898, and hear famous singer-songwriters perform, watch a silent film — or spend a few days during the esteemed Colorado Music Festival. A retail district with killer mountain views, this is where you’ll want to head for brand-name shopping, dining and entertainment, all centered around the open-air Twenty Ninth Street shopping center. Summertime also brings in crowds for outdoor concerts during the Twenty Ninth Street Live music series. A residential district with a big heart, denizens of South Boulder are loyal to its laid-back lifestyle, easy access to trails and esteemed national laboratories. The neighborhood is nestled into the foothills, with beautiful lands to explore. 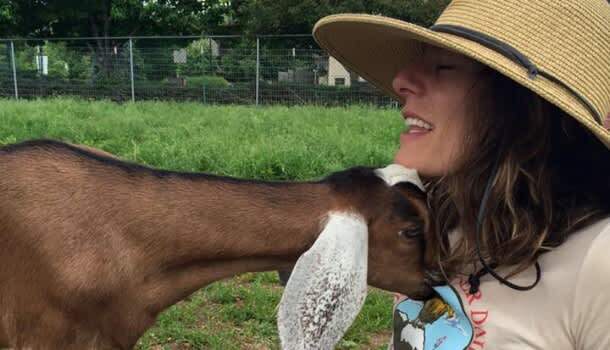 Once an industrial zone, NoBo is quickly becoming a new hangout for young families, artists and fledgling businesses — from breweries and wineries to importers of artisan goods. Rapid growth means plenty of good restaurants to choose from, plus a chance to see Boulder’s up-and-coming artists in action. Sample libations at two wineries and one brewery, all next door to one another: Settembre Cellars, BookCiiff Vineyards and Upslope Brewing. 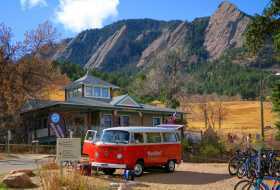 Removed from the hub-bub of central Boulder, this northeast neighborhood outpost is teeming with things to see and do, making it a worthwhile destination for a day or half a day. You’ll drive past beautiful Boulder Reservoir and watch lush farmland roll by your window on the way to several top attractions. Geographically central to the rest of Boulder, this area is close to just about everything and is a frequent hub of activity for visitors who will find hotels, cultural institutions and venerable restaurants. A small enclave just north of downtown, Old North Boulder is characterized by midcentury modern homes, urban farms and the distinctive wavy roofline of the Ideal Broadway Shops and Community Plaza Shopping Center. You’ll find yourself right at home among locals here by grabbing a bite to eat, a cup of tea or browsing a handful of gift shops. We’ve heard this area called the “Brooklyn of Boulder” and think that’s pretty apt. With slightly lower real estate prices, there’s a growing tech industry here, which helps fuel progressive, chef-driven restaurants, plus coffee shops, breweries, a record shop and access via winding bike trails. Since it was founded in 1876, the University of Colorado Boulder has shaped Boulder’s cultural identity as a progressive, forward-thinking city. Today, it’s beautiful campus covers 786 acres, and visitors are welcome to stroll among its signature Tuscan Vernacular Revival buildings, sprawling greens and tree-shaded alcoves. See beautiful Old Main, the college’s original structure; Macky Auditorium, where discussions, readings opera, theater, music and dance performances happen year round; and pop into the University Memorial Center or Center for Community for a bite to eat. 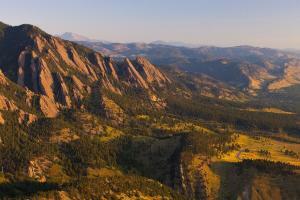 See the complete list of Things to Do at CU.